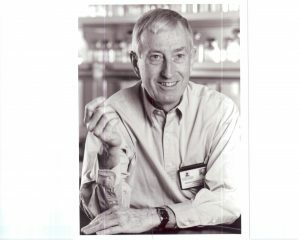 Hunger Mountain editor Leah Kaminsky conducted an interview with Professor Peter Doherty, joint winner of the Nobel Prize in Medicine and Physiology 1996 for a landmark discovery in the field of cellular immunology. The first murder Peter Doherty ever witnessed was committed by his own sweet, grey-haired grandmother back in the 1940s. He was a young child living on the outskirts of the then sleepy town of Brisbane, in Northern Australia. She took him by the hand and led him down to the ‘chook house’ at the bottom of the garden, grabbing a flapping hen along the way. Young Peter watched in awe and fascination as the indulgent, old woman he loved so dearly grabbed an axe and swiftly brought it down onto a wooden block, chopping off the head of what was to become Christmas dinner for the family. He recalls his first days at school, with leather satchels hanging in the sun on the verandah outside the classroom. By lunchtime, he had one of his first encounters with chemistry—as the whole verandah reeked from hydrogen sulphide produced from the rotting egg sandwiches, something he also jokes might have been his first vaccination against E Coli. The family lived in a ‘Queenslander’ built up on stilts and he also recalls his mother dispatching a large, brown snake under the house with the edge of a spade. Years later, when his own fatherly duties included dealing with a bountiful and ever-multiplying brood of gerbils, his own kids were complicit in and intrigued by a mass murder, using chloroform from the lab to cull the gerbils’ furry numbers. Living in Edinburgh in the 1960s, he used to see whole carcasses hanging on hooks in the butcher’s shop. Doherty is very down-to-earth. Spending the first ten years of his life working as a veterinary pathologist, part of his training was to serve as a meat inspector in abattoirs. It was a horrific but grounding experience. He rails against living inside invented narratives such as creationism and climate change denial, drawing attention to Conservapedia.com as a travesty against all the hard work scientists do. When questioned regarding the ethics of scientific experiments using animals, Doherty maintains that the arguments against this practice are specious. At the time they won their first Nobel Prize, Doherty and his colleague Rolf Zinkernagel weren’t even aware they had been nominated. Doherty remembers a moment when he was twelve and his other grandmother lay dying. A Fundamentalist Methodist minister stood beside her bed, reciting Psalm 23. Although he drifted away from religion as an adult, he still derives comfort from the biblical verse that he sees as grounding us here on earth.